Are you an artist or someone who loves creating but has put it on the back burner in lieu of living with less waste? We have been working with Elaine to redesign the walls here at Refill and one of our top reasons we love her is how open about her low waste art making she is. We sat down and dived a little deeper into her process and hope you all feel inspired to get out there and start creating with what you can find. Elaine loves to pull from things that already exist in the world. She will often explore what the local thrift stores have, it could be plain canvases or canvases that already have been painted on. When she begins to start creating on what she has found she may use the current art with her new piece, other times she will completely paint over it. 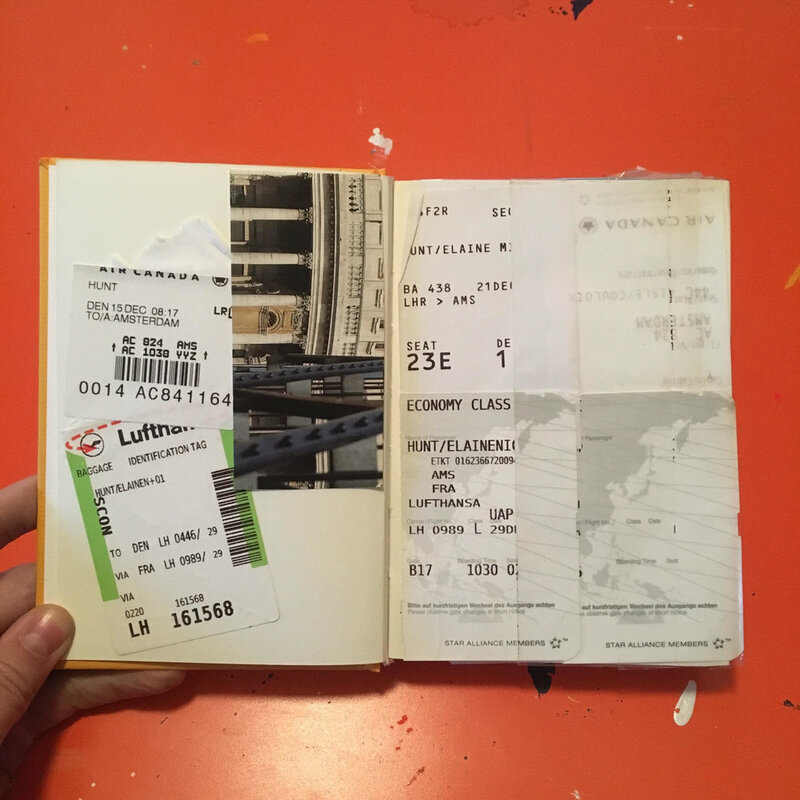 Different items Elaine has collected while traveling. Approaching art in this way is an art in itself. The hunt is part of the process and working with what you already have. Elaine uses this also as a mental exercise and looking at our waste and reevaluating how it can be given new life. When she isn’t using canvas she approaches her creative process in an exploratory way. 1. I use junk mail for various different things: colleagues, using as a tarp to avoid paint drippings but my favorite is finding ways to use it in my art. 2. I always save my water if I know I will be painting again the next day or within the next couple days. I’ve been using the same mason jar for my water for ten years! 3. I use supplies forever. For example: old paintbrushes, sponges and toothbrushes I can no longer paint with or use, I can use it to give my art texture. 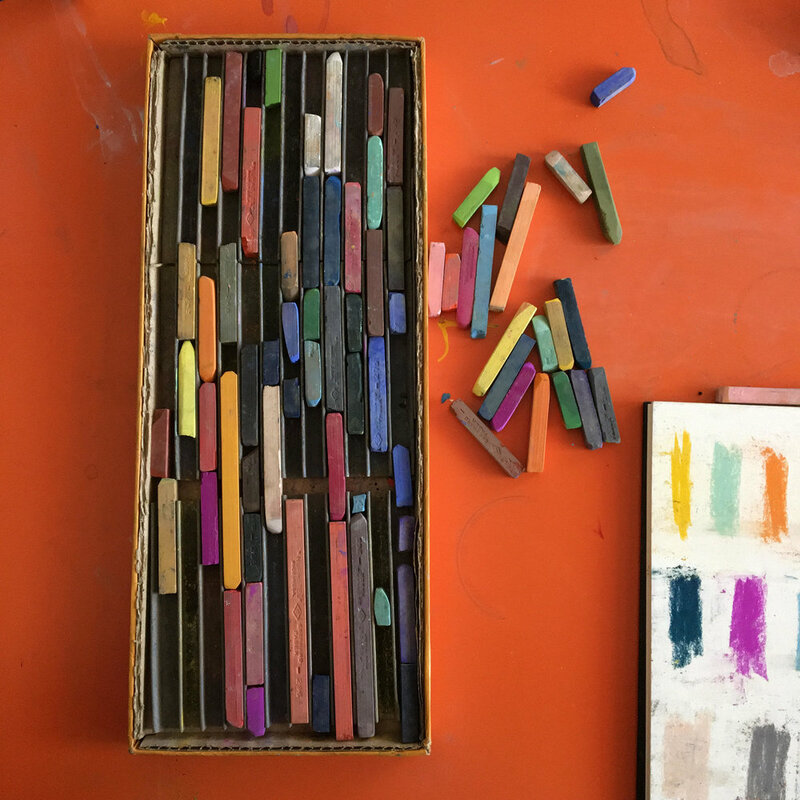 Elaine still uses her great-grandmother’s oil pastels from the 1950s. 4. Receipt papers I have laying around I add to my paintings in some way, like giving my work a 3D element. This is a canvas Elaine bought secondhand before she painted it. This is the piece after Elaine painted it. When items do need to be disposed of or new items purchased, sustainability is always at the forefront. Elaine uses Boulder’s local hazardous waste facility to dispose and always chooses eco-friendly paint. Welcome to the second part of our low waste bathroom saga. If you haven’t yet check out our top tips for transitioning to a low waste bathroom in our last blog post here. We love making simple shifts with products being created to support this lifestyle but we know they aren’t easily available for everyone. It can be hard to buy things in bulk or maybe you want to keep it simpler. Check out some of favorite bathroom products made right at home. Now this is not your average shampoo and conditioner. It will take some adjusting as it did for us. Yet it is the simplest and easiest rinse we have found that actually works. It also is perfect when you are traveling because what is needed is accessible wherever you are in sustainable packaging. Shampoo: 1/2 cup baking soda with 16oz water. Both have the option to add 4-5 drops of tea tree and lavender essential oil. We find this helps with eliminating the vinegar smell but also aids in stimulating the scalp and reducing dandruff. We love doing a deep conditioning hair mask before we wash our hair with the recipe above. It gives us extra shine and leaves our hair feeling soft. It truly could not get any easier either. Mix 1/4 cup of coconut oil with 4-5 drops of tea tree and lavender essential oil. You can also add a few drops of castor oil into the mix it aids in hair growth! Take 5-10mins and massage this mask from you scalp to your ends and give yourself some extra loving attention. Once you’ve given yourself a scalp massage wrap your hair up in a bun or braids and sleep with this in. We suggest either wrapping your hair in a scarf of laying a towel on your pillow to avoid any stains. To rinse first apply your shampoo rinse before getting your hair wet. Then rinse the solution and apply your conditioner rinse let sit for a few moments and rinse with water! Body oils are much needed especially heading into the drier months. You can simply just use a base of olive, coconut or avocado oil and add you favorite essential oils. We currently love adding Palo Santo and Rosewood but the world is your oyster here. We do about 6-10 drops of each to every 8oz of oil. It can be easy to over do it on the essentials oils so we suggest keeping them light as they can be very active on your skin when to much it used. Having a few go to recipes you can make at home has made self care that much easier. We know all those fancy products out in the world look nice but we have so much right here in our own pantry that works incredibly well. Let us know if you give these recipes a try and what you think! We have found making the transition to low waste in the bathroom is one of our favorite things! It gives you an opportunity to really get creative. Many companies are creating products in sustainable packaging and it is fun to explore and learn more about them. It also is a place where you yourself can be creative and make your own products and think outside the box (or plastic packaging)! We have so many helpful tips and tricks for this place in our life but want to start by giving you all our top 5 easy switches. Why a bamboo toothbrush? In just the US alone it is estimated that between 850 million and 1 billion toothbrushes end up in our landfills every year! Now that is insane and we are choosing to say no to adding to this by choosing bamboo. Did you know bamboo is the fastest growing plant on the earth, making it the perfect material for creating a toothbrush. Plus it allows them to be fully compostable! Razors once were sustainable before living sustainably was a thing. If you speak to your grandparents they probably have heard of and used safety razors. They give you a clean and long lasting shave. The base is made of metal and can be reused over and over again. All you must replace is the metal blade. You can choose to recycle it or place it in water once dull and let rust and then place in your compost! Keep in mind it is an adjustment switching from modern day plastic razors to a safety razor they are sharp. Make sure NOT to apply pressure to the razor and just guide it along. This will help you avoid cuts. Taking a shower and using the body wash in a plastic bottle? Say so long to the bottle and pick up a bar of soap in a paper box! Every supermarket offers a bar soap option and it is the perfect replacement if you cannot get your hands on some of our favorite brands and products. Plus if you want to make it last longer cut it into pieces and keep the unused in your drawer or cabinet until your cut piece runs out. It extends the life of the soap beyond what you can imagine! Most people use shampoo and conditioner in plastic. If you haven’t taken the full deep dive into living low waste you may not know of any alternative. This is a place we like to get creative if we cannot buy in bulk. You can make your own or you can use a shampoo bar and replace the conditioner with a small teaspoon of oil massaged in after the shower. Like most things it takes time to flow into this practice, we have all gotten so use to using a liquid soap but trust us it starts to feel normal and your hair will love it! If you are purchasing oils or lotions for your face and body choose glass! Our favorite place to start with body moisturizer is coconut oil in glass. It is affordable and accessible. We do not recommend using it for your face it tends to be to heavy for the gentle skin on your face. If you are looking for a facial option, Yay for Earth is an amazing product by one of our fellow low wasters. Her products fly of the shelves so if you cannot get your hands on it fast enough you can choose an oil like Jojoba. This oil is gentle and you can use it to oil cleanse and then moisturize reducing how many items you need to use in your morning and evening routine. Switch to buying toilet paper in single rolls to reduce the plastic bag or invest in a bidet. They are a perfect alternative to give yourself a nice clean after you use the bathroom without using any paper! We honestly could give suggestions for days so we will be extending this low waste bathroom saga into next week with some of our favorite recipes and DIY hacks! What do you struggle with the most when it comes to plastic packaging in the bathroom, what are you looking for suggestions on? We are here to support you and would love to give you more assistance and resources. Let us know in the comments below and we will include them in the next post! Till next week happy exploring a low waste bathroom! Lets go grocery shopping, and let’s do it low waste! Take a look at your pantry and fridge, what do you see? What is currently wrapped in packaging you got at the store? Is it the fruits and veggies in a plastic package? Is it pre-packaged dinners and meals? We all have our thing what is yours? We understand it can be difficult to cut the waste from your life we have been in your shoes. Somedays especially when traveling we struggle to find a way to avoid plastic. Do you live in an area that does not have access to a bulk store or whole foods? We get it, filling your mason jars and avoiding the packaging can be hard in these situations. So we invite you to use these tips we have suggested below for both the person with a bulk store in their community and the person with just a chain grocery. Bring that reusable tote! Ok, maybe a couple of them! Say no to the plastic bags! Know if you forget the tote bag and your community has recycling you can choose the paper instead! Bring reusable produce bags, we like these here. It can be hard to give up the produce bags and boxes for the fruits and veggies unwrapped. We commonly hear people say they are afraid they are dirty and they will not keep as well. We invite you rinse them, cut them up, and store in an airtight container or wrap them in our favorite plastic wrap alternative, beeswax cloth, It not only makes them last longer but you have everything prepped and ready making it easier to cook at home than eat out on a busy day! Choosing to by produce this way also supports eating seasonal foods, good for you and good for this beautiful Earth! When in doubt check if the thing you are looking for comes in a glass or can form. Glass can be reused, we are armed with many in our pantry and aluminum can be fully recycled! If you have produce bags bring extras for your dried goods and if you do not have that available to you look for things in paper. You can usually find large bags of rice in paper and most pasta is packaged in a box. If this is not available you might have to choose something in plastic but go for the biggest option so you can make it last longer. Bring that reusable napkin we mentioned here with you! It is perfect if you are wanting to get bread, you can go to the bakery and ask them to wrap it for you in your napkin! What about the Deli you ask? Ask if they will wrap everything in paper or bring your own metal tin! Most butchers wrap meat in paper but this is where your voice to say NO comes in. Just ask for what you need! We understand it can be difficult to grocery shop low waste but start small and simple. It takes time to fully shift and that is ok. We invite you to be compassionate with yourself just as you are with this wonderful Mother Earth we are all here striving to protect through our low waste lifestyle. How are you going to move through the market low waste? What tips do you have that have helped you let’s get this conversation started and share our personal tips here in the comments! We have had many request to offer you all a place to come read and learn about living low waste and we are excited you are here for our first post! To kick things off here with you all we are going to return to the foundations. One thing we love about living low waste is finding new purposes for items we have always had. It gives you an opportunity to look at the world and the items we own with new creative eyes. Below you will find the top five items we carry with us on the go. These items have brought us the most ease moving through everyday life being low waste and we hope will help you along your journey! Yes, the most classic “Zero Waste” item but hey its pretty perfect for everything! It works divine for any and all beverages especially if you forget a reusable water bottle. You can also use it to fill up with leftovers from a restaurant or hey what about that soup you are eyeing. Plus if you end up at the market you can put bulk grains in here. They are iconic for a reason and we are not at all ashamed to be jumping on that bandwagon and hope you aren’t also! Yes, yes, yes! These are the best, you can throw the books you got at the library in here, pick up groceries with this, carry all your goodies in it. Plus if you are not using it, it can easily be folded up and placed in your bag or backpack! This napkin isn’t just any old napkin. Yes, it can serve the purpose of wiping the food off your hands and your face. Yet it can serve so many more purposes, wrap your mason jar in it to protect it in your bag, or wrap your reusable utensils in it. Are you looking at that bagel, muffin or loaf of bread but wondering how to avoid the packaging they wrap it in? Ask them to put in your napkin! We also love using it to wrap produce in if we don’t have our reusable produce bags with us! You can reuse an old piece of fabric, bandana or we have a collection of linen napkins here. 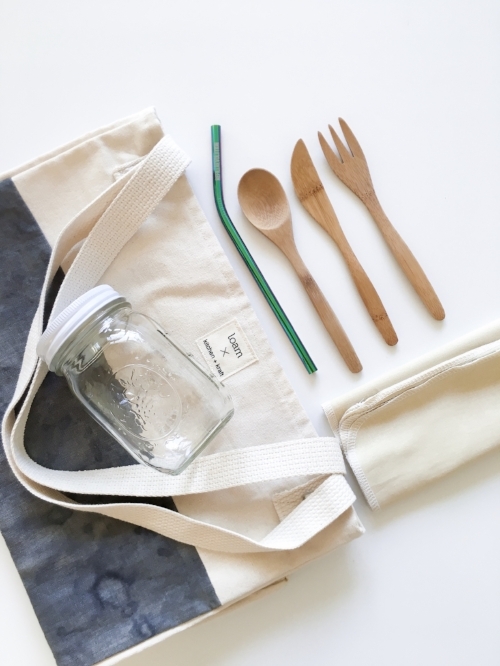 Bringing your own utensils and straw with you is one to the easiest ways to avoid the dreaded single use plastic. Straws might be our worst most enemy and love all the reusable ones that are on the market. Check out our array of options here! Our bamboo utensils are great, they are lightweight and easy to travel with (TSA won't take them away!) but if you are just starting on this low waste journey simply use a fork knife and spoon you already own! No need to buy something if you already have it. 5. A voice to say NO. Are you ready to start this journey? Are you already on it? We hope these tips have helped sparked some new ideas for you either way and cannot wait to see you using them in action! If you have any specific topics, stories or something that lights your heart up that you want to see from us here let us know below in the comments. You guys. We have a new favorite store in Boulder: Refill Revolution. Brittney, the owner, runs a one-woman show where she aims to reduce waste by providing re-usable containers and bulk body care and household products. She offers a variety of products from local liquid detergents to organic herbs sold by the ounce, and you can bring in your own container (or purchase one there!) to fill up. It’s not only super affordable and eco friendly, but it’s also a great place for DIY projects! We spent the afternoon at her shop making bath salts, essential oil "perfume", and body scrub. You can do all kinds of things with the extensive essential oil selection in the store. We chose a roll-on container and then sampled different oils to see which combinations we liked best. Eventually, we decided on an energetic mix of grapefruit and peppermint, but there were so many options to choose from! Whether you want to fill up some old containers you have at home with eco friendly product or want to make a one of a kind gift for a friend or family member, Refill Revolution has a little something for everyone. Plus, it feels good to know that you're reducing waste and getting great quality products in the process!